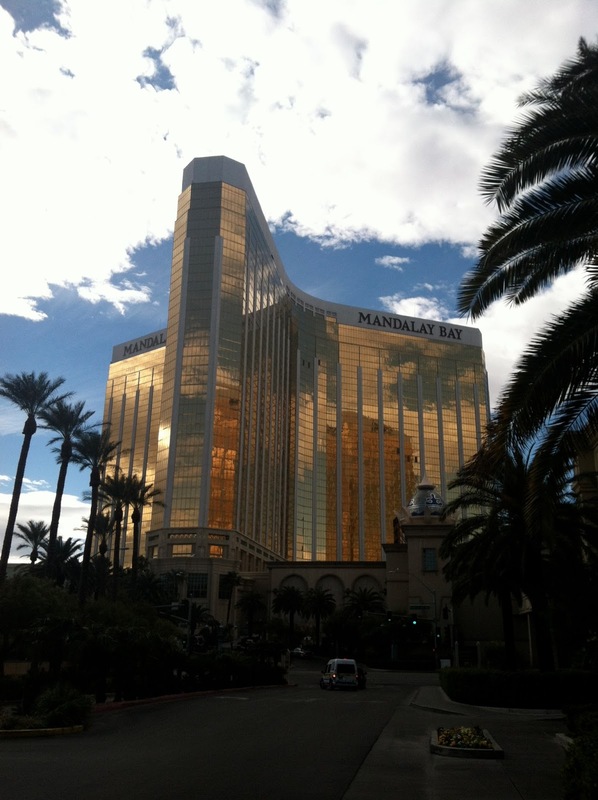 The next two days in Las Vegas, Mom and I explored even more... we started our day with a breakfast buffet (came free with our hotel stay) at Mandalay Bay's Bayside Buffet. The food was so-so; Mom loved diving into the seafood (yes, for breakfast!) but we wouldn't have paid full price for it. I found a lot of the food in Las Vegas to either be fantastic or just "meh". Afterwards, we walked a TON in search of shopping destinations (Fashion Show Mall and Miracle Mile) but I found the stores to be wanting as well. No great finds for this shopaholic! But we did walk by Caesar's Palace. That evening, we went to another show... yup, we splurged on tickets this trip. I'd never been toa Cirque du Soleil show, so we went to the very first one to ever hit Las Vegas: Mystere. There are seven (and counting!) Cirque shows in Vegas, but this one still ranks near the top after 20 years. It was riveting! I think Mom found the clowns a little odd, but the feats of strength and theatricality were top-notch. I want to see more Cirque shows!!! I'd love to come back and see "O" or The Beatles LOVE. On our last day together in Las Vegas, we did what we do best: SHOP. We finally found some great deals at the Las Vegas Premium Outlets - North. I snagged some deals at Ann Taylor, Banana Republic, and Coach! I was definitely more into the shops at the outlet vs. stores on the strip. Thought I will say the Crystals luxury mall is architecturally gorgeous; I just don't need any Louis Vuitton or Tiffany's at the moment. I had so much fun with my Mom in Las Vegas! I'm glad we were able to meet up and enjoy some one-on-one time together.